kite buggy lessons, learn to paracart, kite buggy basics. Like freeways and water ways, Kite buggies also have a general rule of thumb that should be followed. Give everyone plenty of room. Not all pilots have the same skills. People who are new to power kiting and buggying will usually have a large amount of anxiety and could become very nervous if another pilot approaches them quickly or cuts them off. Always give yourself as well as others plenty of room in the event something goes wrong or one of the pilots gets out of control. When landing your kite, make sure you are far enough from other kites and obstacles so that your kite/lines do not interfere with others or become tangled. Always give yourself plenty of room to stop, buggies do not have brakes and on hard packed surfaces will roll for a very long time with little or no power. Hitting a parked car, fences, or brick walls is never fun. When passing or overtaking another pilot, the approaching pilot should always put their kite high in the window and pass upwind of the slower pilot with plenty of room between each other. The slower pilot should put their kite lower in the window and keep it out of the way of the passing pilot. The approaching pilot should notify the slower pilot upon arrival so he/she is aware that you are in his/her vicinity. If two buggies are heading towards each other then both pilots should turn to the right to pass and the downwind pilot should lower their kite and the upwind pilot should raise their kite. Other pilots will not always know what you are planning to do or where you may decide to go. When getting ready to do a turn, check to see if there are any other pilots in your vicinity. 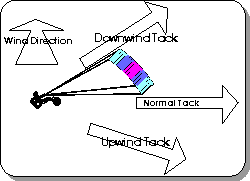 Announce to the other pilots you are going to be executing a tack or jibe so they can adjust their speed or direction if necessary for you to complete your turn without interference. Before you attempt the buggy or any other wind vehicle you should have plenty of skill flying your kite. You should be able to fly your kite in and out of the wind window and be very comfortable with launching and landing your kite. You should also be aware of any safety releases your kite may have and how to activate them quickly without hesitation. For your first run, pick a day that the winds are perfect for your kite. Do not try to learn in overpowered or underpowered conditions as your learning curve will be harder and/or you could become seriously injured. Wear proper equipment including knee pads, elbow pads, helmet, long pants, etc... Make sure that the area you are going to be using is large enough without trees, fences, power lines, dips, rocks, or other obsticals that can cause injury. Never buggy alone. Use extreme caution and be aware of surrounding areas and weather patterns. Take it easy! Getting going is the easy part. Don't try to set any land speed records right out of the gate. Speed can very easily achieved with very little effort, make sure that you can control the speed and the buggy before getting to crazy. Start by pointing your buggy about 30 degrees downwind and to the side of where your kite is staked. Always have your buggy either to the side of you or behind you before you launch your kite. If you do get dragged during launching your kite you do not want to trip over your buggy. Do not launch your kite while you are in the buggy, launch your kite while standing first. Fly your kite back and forth through the wind window to get the feeling of the power and to make sure you do not have too large or too little of a kite to buggy with. The power should be enough to drag you forward and give sufficient amount of pull towards the edge of the window. The power should be moderate, too light and it can be difficult to get the buggy moving. Too much power and it will be difficult to keep the buggy under control. You need to determine where you are going to go. Buggying is the same as sailing. You will need to determine the direction of the wind and then you will be able to plot your course. The easiest way is to stand with your back facing the wind so you are looking directly down wind. Raise your arms to each side of you pointing away and that is the direction(s) you will travel. This is called a tack. Your direction of travel will be perpendicular to the direction of the wind (if the wind is blowing North, you will tack to the east and west). Look in the direction you will be traveling and find a stationary point to guide your buggy towards and lay out your course. As you get moving in the buggy, you will be able to reference this point during your tack to stay on course. Your buggy should be pointing slightly downwind from this reference point. Once you start moving, you will want to turn your buggy so that you are heading towards your reference point. Ok, we have the right kite, the wind is perfect, we have our direction of travel, we have the buggy facing the right direction, we have our safety gear on, we have our reference point and enough area to ride....lets give it a go. First rule when beginning - Never let the kite get behind you while you are in the buggy. If the kite gets behind you it will usually rip you out of the buggy backwards and can cause injury to you, your kite and the kite will be extremely difficult to control. Launch your kite overhead and when you have the kite in control, slowly move to your buggy and sit down. If you are still comfortable with everything, slowly dip the kite into the power directly in front of you and then turn the kite towards the edge of the window and fly it back overhead. If done properly you should feel some pull on the kite and the buggy should start moving forwards. Always turn the kite towards the edge of the window to take the kite overhead as this will help prevent the kite from flying directly downwind of you or behind you. Once you have a little bit of speed start to turn the buggy towards your reference point. If all is well, turn the kite towards the edge of the window again and slowly drop the kite back down in front of you. Continue to "sine" the kite up and down in this figure 8 pattern to maintain consistant motion. As your speed increases, you will not need to "sine" the kite as much and should be able to park the kite about 45 to 50 degrees in front of you and maintain good constant pull. If you get too much speed, slowly fly the kite overhead and you will start to slow down, in worst case situations, drop one handle of the kite and let it fall to the ground or activate your safety release to depower the kite and coast to a stop. If all is well, you should have the kite parked about 10-20 feet above the ground at 45-50 degrees in front of you and moving along smoothly. Taking the kite overhead will allow you to coast and slow down, to speed back up slowly dip the kite out in front of you again. You have just made your first tack. As you are cruising along in your buggy you will eventually run out of room and will need to execute a turn. Turning or changing direction is very easy. A buggy is very agile and can turn very sharp in very little space. The main thing to remember when executing a turn is to do it under control and as quickly as possible. When preparing for your turn, slowly fly the kite overhead and point the buggy slightly upwind to slow down and burn off some speed. Do not come to a complete stop. When you slow enough to feel comfortable to do the turn, turn the buggy sharp downwind towards the kite and keep turning all the way around until you are facing the new dirction you wish to travel. Be careful and aware of the kite during the turn. Keep the kite overhead and do not let the kite fly behind you or suddenly drop down into the power. If this happens and you get out of control, drop one handle or activate your safety release and come to a stop. Once the turn has been completed and you feel comfortable, slowly fly the kite down in front of you in the direction you are now traveling and begin picking up speed again. Slowly power up the kite only after the turn has been completed. After a couple turns, you should start feeling comfortable with the maneuver and be able to time the kite with the exit of the turn to make the turn quick and smooth. To stop, slowly bring the kite overhead to slow down and coast to a stop. When you have slowed down enough, you can put your feet down to help you stop. While stopping, keep constant control of the kite and do not let the the kite drop down into the power or fly behind you. Once the buggy has come to a complete stop, stand up and walk downwind from the buggy and land your kite. Getting back to where you started. Getting back to where you started usually takes a little bit of buggy practice. To return to your starting point you will need to travel upwind. When you get some decent speed in your buggy, slowly begin to turn the buggy in small increments away from the kite "upwind" and continue sining the kite in front of you near the edge of the window. As you start to turn upwind, the power of the kite should inclrease slightly. If you still have good speed and power, turn the buggy upwind a little more. Each time you point the buggy to a new heading, hold that position and monitor the power of the kite for a good balance of buggy speed and power. You will eventually reach a point where you will not be able to turn upwind any further and still maintain your current speed. If you point upwind too far you will begin to lose speed as the kite will have arrived to the maximum edge of the wind window. If you continue on this heading you will eventually come to a stop. Be sure to pay close attention to the kite so it does not end up behind you or collapse. If you wish to continue and resume your speed, slowly turn the buggy downwind a little to where you last experienced good power and speed. As your experience in the buggy increases, so will your feel of how much upwind you will be able to handle. Don't get frustrated if you are not able to go upwind very well when you first begin, sometimes it takes a couple weeks in the buggy until you finally figure out how to get good upwind and still maintain kite control and power. Take your time and have fun, it will all come together soon.